Of course, we cannot, though in Nox Carson gives it perhaps the best try I’ve ever witnessed. What she arrives at is all the more impressive for how little she has to go on. Nox is a reproduction of the scrapbook Carson put together after her brother, whom she hadn’t seen for over twenty years, died in 2000, just as she was planning to visit him after a recent reconnection. 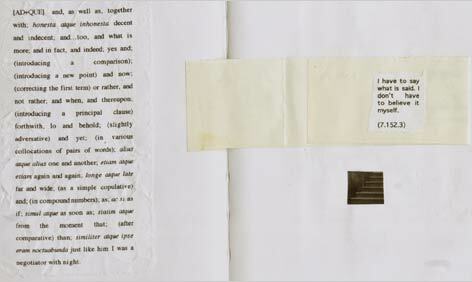 A collage of words, stamps, old letters, photographs, and artwork in various mediums — all copied with amazing effect onto a continuous accordion-folded length of paper and encased in what transcends its boxy gray cardboard form to become nothing less than a sarcophagus — it’s Carson’s “epitaph” to her lost sibling. On its cover, he stands guard in a photo taken at about ten years of age, obscured even then by a pair of dark swim goggles that cover most of his face. He “ran away in 1978, rather than go to jail,” she writes. “He was traveling on a false passport and living under other people’s names. This isn’t hard to arrange. It is irremediable.” This fragment, one of the few pieces of hard information we get, appears on four pages in a row, accompanied by various snippets of the one letter he wrote home to Carson’s mother during his absence, as Carson tries to give her story a start. This is where Carson’s gift for fragments gathers force. While the Catullus poem is moving in its own right, it bears the mark of closure — its final words are “farewell and farewell” — and as such is final. Carson’s gestures towards understanding are ever in motion, like those gilded leaves, and the bits and pieces that make up her grief take on a shimmering currency in her hands. They may not add up to a whole in the traditional sense, but they overwhelm Catullus’s elegy by a landslide with their raw, open-edged emotion. Carson knows, as anyone who’s lost someone they love knows, that there will be no end to the trying to make sense, no end to the sorrow and the mystery that come with death. “He refuses, he is in the stairwell, he disappears,” she offers on her final page, conjugating her loss in some deeply resonant private language that needs no translation for us to comprehend. Like someone who has died, her creation both bestows a great depth of knowledge and leaves us longing for more. Melanie Rehak is the author of Girl Sleuth: Nancy Drew and the Women Who Created Her. Her new book, Eating For Beginners, will be published in July of 2010.